No, the title of this post is not a reference to my social life, but rather, a creative collective that we've come across at WonderCon and A.P.E. 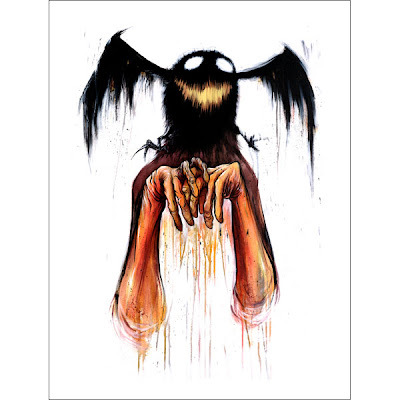 I was reminded of Zerofriends and the art of Alex Pardee by a recent post at Laughing Squid talking about his newly released print, The Delusionist. Alex has some interesting takes on the bg/ag fav, Batmaing... er, Batman. 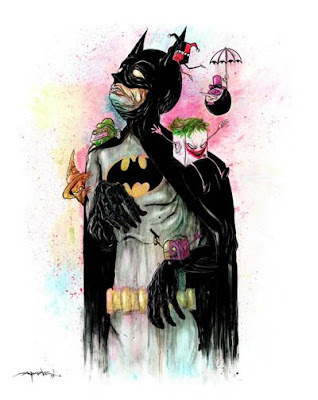 "BATMAN (yah, your favorite masked detective) was originally an ancient mythical cult being whose story was basically about a bat hunter who, in a fit of symbiotic revenge rage, captured the bat that killed his wife and, since he couldnt live without his wife, he wanted to show the bat what it was like to depend on someone else for life and love. So the hunter shoved the Bat onto his head like a mask and forced the bat to remain a part of him. Shortly after, the tables turned and the hunter's foolish attempt at revenge backfired when he suffocated and died. The bat then took over the hunter's body and used his new found appendages and abilities to lead warriors to kill weak people because it was fun. True story." "To honor one of my favorite Super Heroes, I asked the now-ridiculously-popular-because-of-his-new-movie-which-may-be-one-of-my-favorite-movies-of-all-time, elusive hero to take some time to sit for me while I painted his portrait. He obliged, but what do you know, during the sitting, who decided to parachute in? A handful of Supervillains that WE BOTH THOUGHT WERE LOCKED UP OR DEAD!! But I guess that's the life of Batman. (Sighhh)."